Tonight's episode of Monday Night Raw kicked off with the farewell of The Shield, as all three members of the group seemingly took to the ring for the one final time and did the traditional Shield fist bump before addressing the WWE Universe. While addressing the audience tonight, both Roman Reigns and Dean Ambrose also made a major announcement on the Road To WrestleMania 35. Having successfully won his battle against leukemia and announcing his return to in-ring competition on 25th February 2019, Roman Reigns made his official in-ring return last night at the Fastlane pay-per-view. 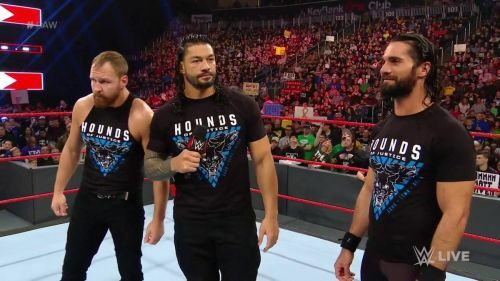 Within one week after announcing his return to in-ring competition, Reigns and Rollins reunited the band one last time, as they reunited with their Shield brethren Dean Ambrose, who as per rumors is on his way out of the WWE after WrestleMania 35. At Fastlane, The Shield competed in their final match under WWE defeating the menacing trio of Drew McIntyre, Bobby Lashley, and Baron Corbin in an explosive six-man tag team match. With The Shield having competed in their final match in WWE, it is now time for all three members of the group to go their separate paths, as Seth Rollins prepares himself to go toe-to-toe with 'The Beast' Brock Lesnar at WrestleMania 35 with the Universal Championship on the line. Whereas, as for Dean Ambrose and Roman Reigns, the two former World Champions have also decided to focus on their singles careers on the Road To WrestleMania. As for Ambrose, 'The Lunatic Fringe' isn't really sure what the Road To 'Mania 35 has in store for him, however, 'The Big Dog', on the other hand, has made it clear that he will be returning to singles action tonight. And for his first singles opponent, the former Universal Champion will go toe-to-toe with Baron Corbin later tonight on Raw. With the farewell of The Shield, it is now time for all three members of the group to focus on their singles careers and it is pretty likely that along with the inclusion of Seth Rollins, both Reigns and Ambrose will also compete in high profile matches at WrestleMania 35 as well.